Often, people ask me how they can help a friend who is going through a tragedy or loss. There are literally thousands of ways, but here’s my best bottom-line advice: Be brave. Do exactly whatever God urges you to do, no matter how unusual it seems. Recently, a young woman did that for me. Let me tell you the story. Right before Christmas, I received a Facebook friend request from a person I didn’t recognize. I clicked on her page and looked to see where she lives. That didn’t help. I often receive new requests after I’ve spoken at an event or a retreat, but I hadn’t been near her. Then I looked at our mutual friends. That gave me a clue. All of our mutual friends were friends of my children. So, I messaged one of them and discovered that yes, she was a classmate of my son, Jayden. It’s always such a joy to connect to someone who knew my son. So, I gladly accepted her friendship. I was driving yesterday and felt the Lord put you on my heart. I know this is Him loving on you a little extra during the Christmas season! Jayden sat behind me in math class in 6th grade I remember him being so funny. I’d like to send you a Christmas gift on his behalf if that’s okay with you! She remembered my son even though it’s been 14 years. They were only 11 years old in the 6th grade. Who remembers a kid behind them in math class in the 6th grade? But she didn’t just remember, no, she bothered to find me! How did she find me? How did she even know my name . . . and she wants to give me something? A gift. From Jayden. Of course, I want it. What in the world will it be? How would she know what to do? Wait, you know this Lora – this is God’s doing. The days ticked by and I waited. One night I remembered I hadn’t been to the mailbox yet. So, I pulled on my shoes and walked out into the darkness to retrieve the mail. There it was. I stared at it awhile, almost afraid to open it. Then I gingerly tore open the top of the envelope. Inside, I found a card from the young lady. She said she had been waiting for God to tell her what to say. Under the card, lay a little box. Inside the box was a simple necklace with a simple, yet profound message. 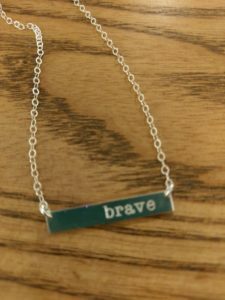 “Brave” necklace from God and my son Jayden. Christmas 2018. That’s how I’ve always pictured Jayden in heaven. A warrior, battling for me, for all of us, in the power of God, until the enemy is ultimately and completely defeated. He has no need to be afraid, because he knows the victory is sure. The strong message from heaven reverberated through me. I need to be brave. God wants me to be brave. He is labeling me with a necklace that says brave. Wow. God is so good and so faithful. He’s singing over you, Lora! 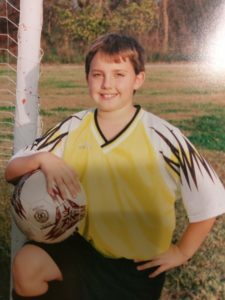 He is right with you – let Heaven come to earth & walk through the victory Jayden has. She had no idea that God sang over me the night of the accident. Or that the name of my book is “Song of a Wounded Heart.” She didn’t know. So when she said it, I knew beyond a shadow of a doubt that this was God’s word to me. So, my friends, when God urges you to do something, or say something to someone who is grieving, or struggling, or . . . Be brave, and do it. Trust the God who is giving you the message. He knows your friend. He knows exactly what they need. Let Him use you. Thank you Jen. For being brave. Thank you Jayden, for being my brave warrior. I love you so much. Above all, thank you God, for this precious message. Please help me be brave. WOW!!! I don’t know what else to say… What a gift! Tears… you ARE brave, Lora, & you were even when you family’s address was earth, not heaven. Thanks for sharing, so nice to see Jayden’s picture. I cry reading the outcome of this wonderful story. I cry for many reasons. God allowed me to be a small part from the very beginning. I can now see God’s hand working months before she contacted you. You see, Jen is my daughter. We had been working on a plan to have her wisdom teeth removed. In September she finally relented and told me to go ahead and make arrangements. Jen and her family live in Colorado but we wanted the surgery done here so that her husband didn’t have to take off from work (so we could have him here at Christmas). This also gave this Nana more precious time with Jen and my grand babies. So I went to work making arrangements, consult in October and surgery a week before Christmas. Jen and the kids flew home in October and now fast forward to December. In the past Jen and the kids have always flown in a week before Christmas and her husband drove 11 hours on the 23rd, after leading worship. We were assuming that we would use the same plan and then God intervened. Jen called me and said she worried about her husband driving this year and decided that she and the kids would drive and he could fly in. So you see, God appointed the day and the hour. He allowed Jen to have the driving time in order to speak to her. I am so proud that she proud that she listened and obeyed. She was so excited when she told me God had spoken to her and she was busy trying to locate you. Brave. So from one mom to another, we both can relate. Liz, God is in the details. I simply stand amazed at this entire story. I’m confident it’s not the end of the story, and I look forward to hearing what God will do in Jen’s life. When we are obedient, He is able to do the miraculous! I also look forward to how He will work in my own life. I’m still astounded at the word Brave. I think it’s the last word I would have used to describe my life in the last few months. Fear would have been a more accurate description. But God lovingly used extraordinary means to tell me to not be afraid. This is such confirmation of His presence, and such a huge reminder that I have nothing to fear. I feel renamed and I am trying to absorb the truth of the name. Thank you for sharing this part of the story. I am blessed by your daughter. Thank you. Lora, you are one of the bravest people I know. And your love for the Lord is inspiring. Thank you so very much for sharing this wonderful story. You are a true blessing to those of us who listen to what the Lord asks you to share. Thank you Kathy! You are right. God is faithful. He hears our prayers. He loves us. And He walks us through. I’m living proof. Your sharing, from the first time I met you as our speaker at cannon beach conference center, to your story you continue to share, has served to repair. A friendship long past was repaired in small steps with dear Suzanne that began that retreat. It was not overnight, but over months of continuing to be brave and reach out as the Lord directed. Seeing healing take place in each of our lives here, and yours too, has encouraged our hearts. There is so much we still yearn for, though we trust our King to give us peace to rest in His arms for time to bring us to the next place in our journey. I look forward to reading your book and hope to hear you speak again soon. Thank you so much Mary Lou! It’s so encouraging to me to hear of God’s work among His people. God is good, and we can trust Him to make good things out of anything! !